The climate of Hungary is continental, with cold winters and warm summers, sometimes hot. Spring and autumn are mild, but there are frequent changes in temperature, especially in spring. Precipitation is not abundant, but it is well distributed throughout the year: in Budapest, the capital, 610 millimeters (24 inches) of rain fall per year, with a minimum of 35/45 mm (1.4/1.8 in) per month from December to April and a maximum of 70 mm (2.8 in) in May and June. During winter, snow or sleet are quite frequent, while from May to August, thunderstorms may occur during the afternoon. Here is the average precipitation in Budapest. The climatic differences between the different regions are not great. In Budapest, near the center of the country, the average temperature in January is -1.5 degrees Celsius (29.5 °F), while in July it's about 21 °C (70 °F). In Debrecen, in the east, the average temperature ranges from -2 °C (28 °F) to 20.5 °C (69 °F). Here are the average temperatures in Budapest. 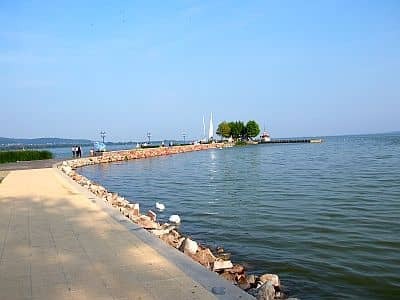 On the shores of Lake Balaton, a large but not deep lake, in winter the weather is usually a bit less cold and dull, except during cold waves, when it's cold anyway, while in summer the breezes temper the heat. In summer, the lake is warm enough for swimming. During the winter, from December to February, gray skies, mists and fogs are frequent. Snowfalls are quite frequent, though not abundant. Sometimes, cold air masses from Russia can lower the temperature by many degrees, down to -20 °C (-4 °F), and sometimes even below. Summer, from June to August, is warm and quite sunny, though with fairly frequent thunderstorms in the afternoon. Sometimes, warm air masses from Southern Europe can raise the temperature for a few days, around or even above 35 °C (95 °F), usually in July and August, but sometimes also in June and September. On the other hand, sometimes even in summer, Atlantic weather fronts can reach the country, bringing cool and rainy weather. The sun in Hungary is rarely seen in winter, while in the summer it shines quite often. The best periods to visit Hungary are spring and autumn, in particular the months of May, June and September. The middle of summer, in July and August, is generally a good period as well, although sometimes it can get very hot. In winter: bring warm clothing, a sweater, a down jacket, gloves and a scarf; a raincoat or umbrella. In summer: bring light clothes, a T-shirt and shorts, but also long pants, a light jacket and a sweater for the evening and for cooler days; a raincoat or umbrella.